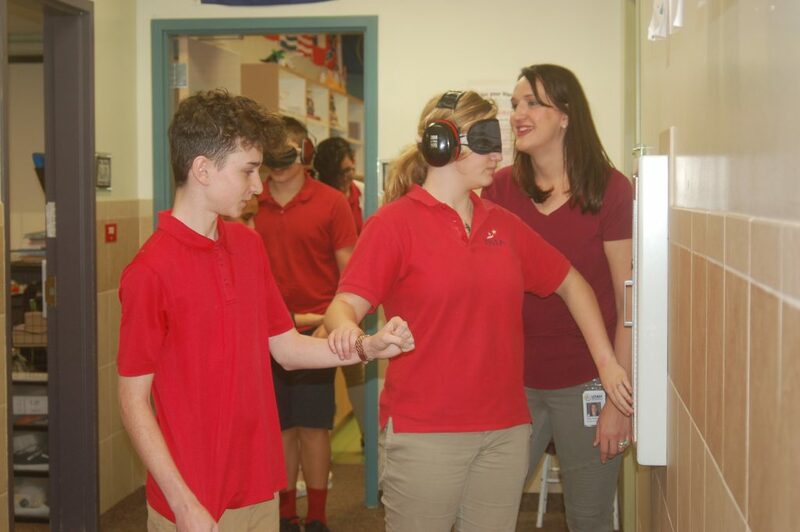 IVINS — Students, faculty and staff at Vista School – a public charter school in Ivins for students in grades K-8 – participated in an experience Tuesday and Wednesday that simulated deaf-blindness. Organized and taught by teachers from the Deaf-Blind Services division of the Utah Schools for the Deaf & the Blind, the program gave students and staff a small taste of what it is like to live with deaf-blindness as well as helped students understand how to approach and interact with their non-seeing and non-hearing peers. Deaf-blindness is a low-incidence disability, said Susan Patten, the Deaf-Blind Services director. In Utah, there are between 140-150 students throughout school districts, in charter schools and in the Utah Schools for the Deaf & the Blind who have both hearing and vision loss or impairment, she said. 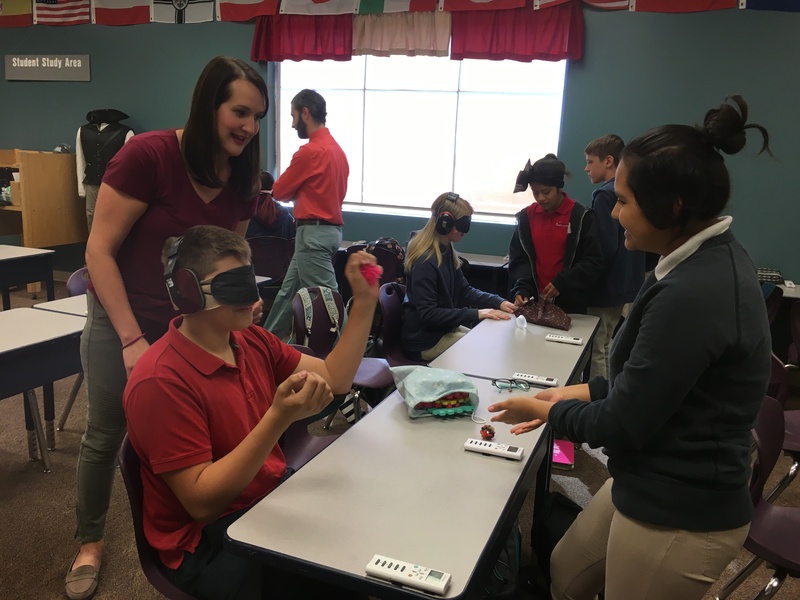 One of those students attends Vista School, and the school wanted to hold the activity to help its staff and students understand their deaf-blind student better and learn ways to include and build friendships with that student. The activity was held on the heels of the school’s “kindness week” which took place last week, said Michelle Hansen, the school’s parent and student coordinator, and they wanted to continue to promote ways to be kind with the experience. In addition to understanding their deaf-blind student better, the school also wanted to provide more education and awareness of their students and other children with disabilities. “It has been very eye opening for not only our students but for a lot of our staff members who participated as well,” said Chris Barnum, director of Special Education at Vista School. Classrooms participating in the experience Wednesday were broken into two groups. While one group was immersed in the experience of being both deaf and blind, the other group was instructed on how to act as their guide. 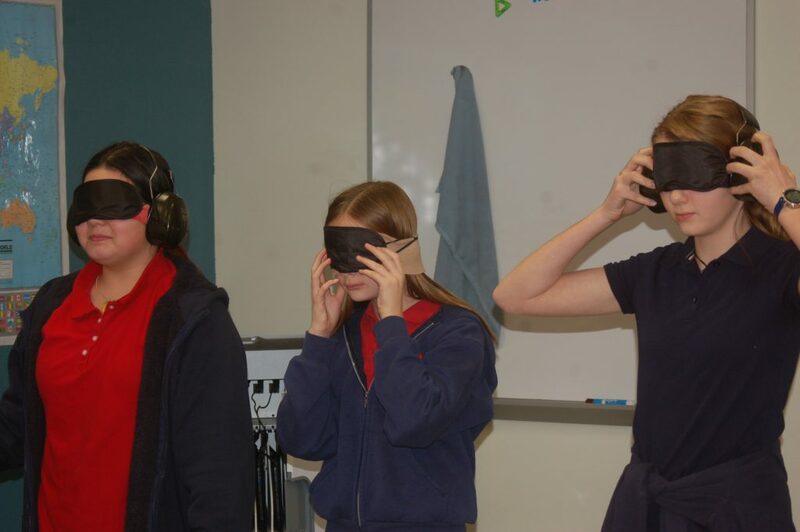 To simulate deaf-blindness students wore ear plugs and head phones as well as two layers of blindfolds. 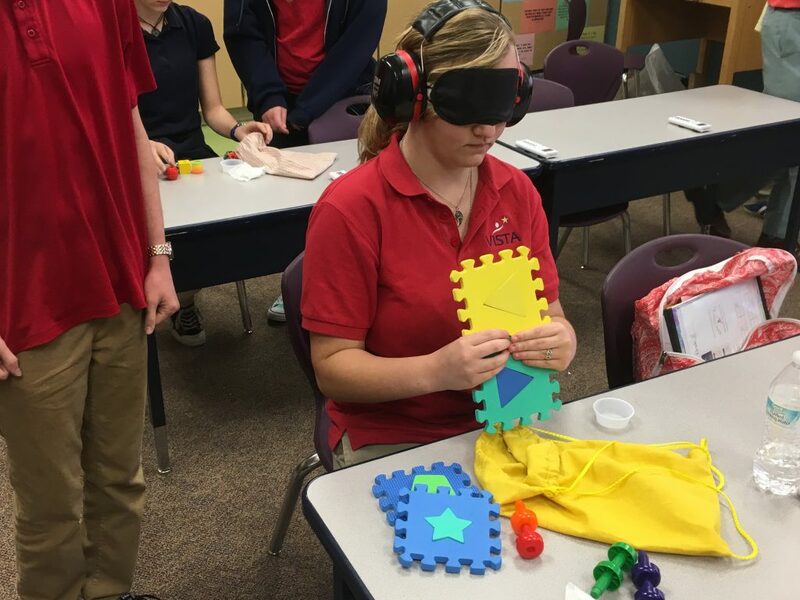 Guiding students took their simulated deaf-blind peers through parts of the school, helped them get drinks, eat food and complete tasks like putting together puzzles. 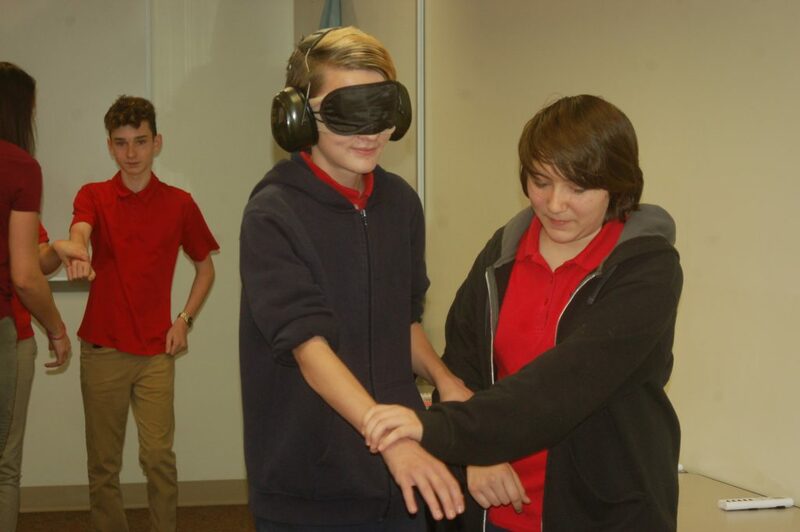 At the end of the simulation, the groups switched so everyone was able to experience being deaf-blind as well as being a guide. Students then participated in a powerful discussion about the things they felt and the different ways in which they learned to navigate the world around them without the use of their eyes or ears. Esther DeWitt, an eighth-grader at Vista School, said the experience was a lot of fun and described the feeling of dependence she got as she was being led around the school. “When someone is not leading you, you just feel empty and in space,” she said. DeWitt said that now, as she interacts with students who are deaf-blind or have other disabilities, she will have a small knowledge of the things they deal with on a daily basis which will in turn give her the ability to help them and be their friend. If there is any takeaway that Patten wants Vista School to really gain from the experience it would be empathy, she said. “We don’t want them to feel sorry for our deaf-blind student, we want them to try and understand our deaf-blind student,” Patten said. At the end of the two days, almost all of Vista School’s student, faculty and staff participated in the experience, Barnum said, nearly 1,000 people. Patten hopes that everyone who participated will take what they learned and teach their families and the community as well.